Every year I treat myself to one or two designer baubles and a few high street branded ones that I adore. I always remember my Nans Christmas tree with a decoration on every branch, all different, all unique. She was always able to pick one up and tell me where she brought it and who she was with. I though it was such a lovely idea that now I can do it myself, I do! 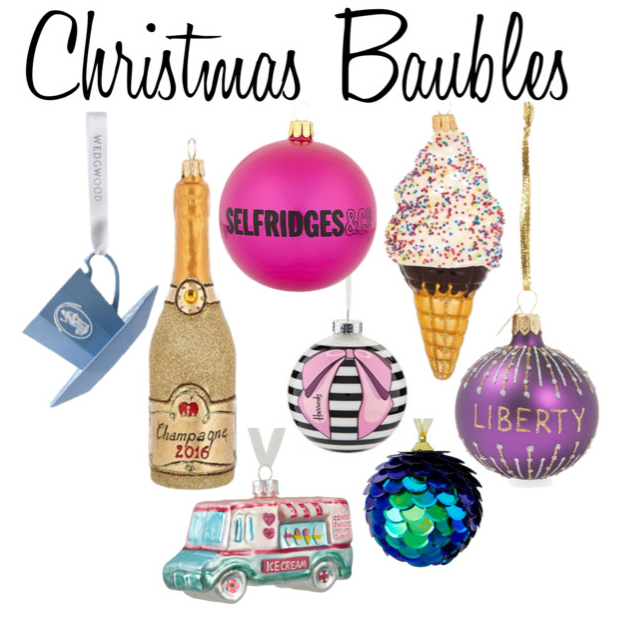 So here's my Christmas Bauble 2016 wish list! I usually head to Harrods and Selfridges around Christmas as I adore spending hours looking at gorgeous gifts and end up buying a few baubles then. I usually hate going into London but it's become a bit of a Christmas tradition for me, just a shame this year I have to far to travel. While some of these baubles aren't exactly purse friendly, as they are items I'll keep for years to come and will always hold memories I don't mind splashing out. These are all so pretty, I love the Ice Cream cone one.